Lees Ferry is a tiny settlement next to the Colorado River at the end of a side road 6 miles from ALT US 89 in north Arizona, not especially interesting itself but surrounded by some remarkable scenery. The village is named after John D. Lee, a Mormon settler with 17 wives who established a ferry there in 1871 whilst in exile following his role in the massacre of 120 emigrants near St. George, Utah, at a place called Mountain Meadows (for which he was later executed). The ferry provided the only crossing of the river for nearly 60 years until a bridge was built a few miles downstream, where the present day route 89 crosses now. 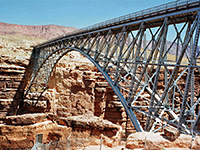 A wider replacement bridge was completed in 1995 and together with the highway past Glen Canyon Dam this is one of only two bridges across the Colorado for many hundreds of miles between the Hoover Dam on the Nevada border and Hite, in Utah. Area map of Lees Ferry and nearby canyons. Officially, Lees Ferry marks the beginning of the Grand Canyon, as the land slopes gently down to the west side of the river but after a short distance downstream there are cliffs at both sides which become steadily higher as the Colorado flows south. The initial section is known as Marble Canyon, so named because of the very colorful rocks, but apart from the US 89 road bridge there is no easily accessible viewpoint, though over the ten miles or so south of the bridge, the Colorado has several fascinating narrow tributary canyons including Sevenmile Draw, Soap Canyon, Jackass Creek and Badger Canyon, some of which provide quite easy routes to the river. Because of its location, Lees Ferry is the starting point for most raft trips down the Grand Canyon, and these are so popular that reservations have to be booked up to a year in advance. The ferry site is 15 miles south of Glen Canyon Dam which was completed in 1963, flooding a large area of remote desert, including most of Glen Canyon which was said to rival the Grand Canyon in its grandeur. The section of canyon south of the dam is thus the only remaining part; boat trips are available down this too (from the base of the dam to Lees Ferry), allowing people to have some idea of what has been lost. 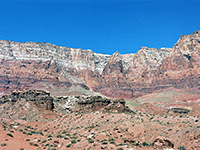 The most spectacular and visible natural feature in the Lees Ferry area is the Vermilion Cliffs, an amazingly colorful escarpment stretching over 30 miles southwest towards Jacob Lake; road 89 runs alongside at the foot of the cliffs for most of the way, providing excellent views before turning away and climbing steeply up to the forested Kaibab Plateau. 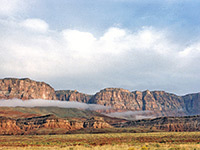 The cliffs and the Paria Plateau beyond are now within the new Vermilion Cliffs National Monument. On the other (east) side of the Colorado River, US 89 runs south past the equally colorful and even longer Echo Cliffs on land of the Navajo Indian Reservation, then continues south across the Painted Desert. Lees Ferry has a few basic facilities including a scenic NPS campground (with an active lizard population) close to the river - $12 per site in 2012 - and several historic buildings such as old ranches, a cemetery, and the remains of a post office and fort. 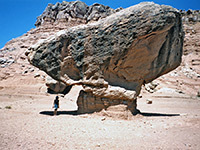 It also provides a starting point for hiking trips up the Paria River, which joins the Colorado after flowing through Paria Canyon, parts of which are up to 1,000 feet high but only a few meters wide; the Buckskin Gulch slot canyon is a well-known tributary. However it takes several days walking to reach the trailhead at the upper end of the canyon so the journey should not be undertaken lightly. Most of the Paria River further upstream is now contained within the Grand Staircase - Escalante National Monument. The nearest town with hotels close to Lees Ferry is Page (43 miles).